Seth Sutherland, RN. It seems almost surreal to add those last two letters to my name; those letters which have seemed to elude me for so long. My journey started years ago when I decided to become a nurse. I’ve always dreamed of doing mission aviation and I realized that medical experience is an essential skill to have in that sort of environment. Becoming a doctor seemed like too much school for me, so I settled for becoming a nurse. With that objective in mind, I enrolled at Southern Adventist University and became one of the many excited students ready to change the world right away. But little did I know how many lessons God had in store for me over the next four and a half years, one of the most difficult being trust. I guess I shouldn’t say I settled on nursing. Actually, after I started driving ambulances at the age of 17 and hanging around medical people more, I realized just how much nursing fit me. If you look at every profession there is in the medical field, none of them spend as much time with the patients as nurses do. For me, that was the final straw in my decision to become a nurse; I love people and wanted to spend my life serving others. Growing up, we hardly ever went to the doctors. I can count on one hand the times I visited those horrid places called hospitals, and two of those visits simply were putting on and taking off a cast after I broke my wrist. However, I was determined to not let my lack of real life experience hinder my learning. The first semester was a breeze. Being homeschooled definitely gave me an edge on the classes, especially in Comp 1 and 2. I was accepted into the nursing program the very next semester and that’s when reality hit. Christmas rolled slowly around and I felt like a total failure. I’d never failed anything in my life (well, there was the time I hooked a stunt kite up to a sled and crashed into a tree, but I’m talking about major stuff here) and wasn’t sure how to deal with it. My friends and family kept encouraging me that it was only a minor setback and I was still going to do well. Consequently, that next semester found me sitting with the nursing class that used to be behind me. I met a lot of cool new people and began to think things weren’t going to be that bad after all. Near the end of level two though, I again began struggling with the tests and at one point nearly gave up. I knew if I didn’t make the passing grade, I’d be kicked out of the program so I was going to just switch majors and take the easy way out. Until I was in skills lab one day and the professor told a story and read Jeremiah 29:11 to the class. To this day I can’t recall the story but I remember precisely how I got this overwhelming feeling that God was speaking directly through her. The dream God had given me to become a nurse was as relevant then as it was when I first felt called to the medical field. So I stuck that semester out, and the next as well. But when my final grades came in after level 3, my test average was only 77%. Due to the school’s policy, I was out of the program and would have to restart. Failing only one semester away from graduation was heartbreaking. Again, I questioned everything. I didn’t know whether God was still calling me to be a nurse or not. There was nothing more embarrassing then telling people I had failed a nursing class, again, and had to restart the program. I went to the learning support center at our school and after working with me for a bit, the lady there told me I had ADD. Although she couldn’t officially diagnose me, her entire job is working with students who have learning disabilities and she’s worked with many who are ADD and ADHD. Suddenly things began to make sense. The reason I can be so creative and sporadic, the reason I could feel completely at home in the clinical environment yet keep failing tests, became clear to me. The nursing program is set up with computerized testing for every test, and about 15 minutes in to the tests, my brain would check out. Unfortunately, most tests lasted anywhere from 1 to 3 hours. Did I feel like I had a disability? Not at all. I just realized that computer tests and I did not get along. But knowing why I was failing the tests didn’t ease the pain as I faced reality the next fall and began the long ordeal all over again. If I were to document my spiritual journey during this entire process, space and time would fail me. There were times I felt like a failure and didn’t feel like pursuing the dream anymore. 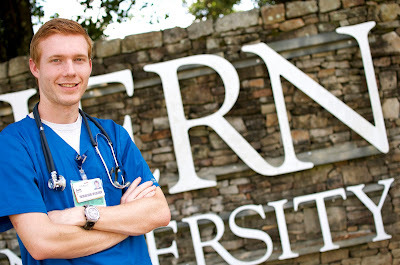 I told God that if He truly called me to nursing, He should have gotten me through sooner. It was hard to see my friends move on and then graduate while I went back to “learning” how to program an IV pump. But that summer was a huge life changer for me. I was facing one of the most difficult setbacks in my life and felt unsure whether God had truly called me or whether I was just doing nursing because it was a stable career and a seemingly good choice. I considered other options. I thought about dropping out and joining the Coast Guard. I thought about dropping out and doing a lot of things, actually. I was at an all time spiritual low. And that’s when God opened my eyes to 1 Kings 19 in a whole new light. As I read the story of Elijah, I realized that I fall into the temptation of wanting only the big things from God. I wanted to see the fire, the wind, the earthquake. I wanted to get my nursing degree. I wanted to blaze through college, finishing fast and strong. But God reminded me that sometimes His ways are made known by His still, small voice alone. When I felt like a failure, when my hopes were crushed, when the future seemed bleak and forlorn, God was still calling me to listen to His voice. And so I listened. And as I began to open my heart to hear His voice once again, I could hear Him calling. My calling. A reminder that He still wanted me to be a nurse. He still wanted me to follow my dreams. Slowly I began to trust His calling. I realized I had been trying to conquer school on my own and not letting God have complete control of my life. Later that summer, I felt strongly impressed to rededicate myself to God through baptism and consecrate my life to following the dreams God had given me, no matter what. And I’ve never looked back since. The next year went by swiftly as I started back through the nursing program. But this time, my attitude was different. Instead of viewing this as a setback, I viewed it as an opportunity to meet new people and teach fellow students what I’d already learned. I loved every minute of it (except for when I had to take the tests of course) and met people who changed my life in so many positive ways. Around this time I got an official diagnosis of ADD after passing (or failing?) the Quotient test used in diagnosis. At least I now had an real excuse whenever people teased me for my random jokes or off topic thoughts. I had one final blow however when I failed to make the passing benchmark to graduate last Fall. Again, the feelings of failure were almost too overwhelming as I struggled with whether I was even capable of being a nurse. But although I struggled with computer tests, I kept excelling in the real life clinical aspect. And once again, I chose to claim God at His word. I began to realize that God’s callings are His enablings. He worked a miracle on my behalf and I was able to repeat the last semester and successfully graduate on May the 8th, 2016! But graduation wasn’t as meaningful to me as the nurse pinning on May 7th. For it was on that day that the dream God had given me, so many years before, got pinned on my life forever. I wore my grandmother’s nursing pin as my friend and professor Dana Krause added my own SAU pin to the family’s nursing heritage. I recited the nursing pledge with my fellow nursing graduates as we dedicated our lives to serving others. After graduating from Southern’s nursing program, the last hurdle to face was the NCLEX. I took the test on July 5 and passed it with no problems. And that was the day that God reminded me once again to trust Him. Though it takes years, trust Him. Though my doubts are more numerous than the drops in the ocean, trust Him. Though friends come and go, though sleep becomes a thing of the past, though everything seems bent on killing my dreams, trust Him. My dreams don’t end with nursing. Far from it! My dream of flying airplanes is still a reality. My dream of being a mission pilot in a third world country is just as real as ever. My dream of changing the world, sharing my story, challenging perspectives, will never be abandoned. And no matter what the obstacles, no matter what the challenges, I serve a God who created my dreams, who created me, and who created the universe. My God can’t be stopped.